FreeLotto.com - How It Works? Signing up on FreeLotto.com is very easy. You will need to complete a form with your name and your contact information. Getting signed up should only take a couple of minutes. Check your email address regularly since you will receive some promotional emails about new games and sweepstakes you can enter. 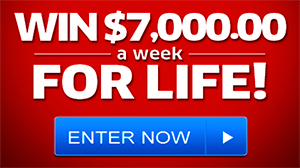 There are six different sweepstakes you can enter on a daily basis. Entering the sweepstakes is very easy. All you have to do is visit FreeLotto and select your numbers for the day. You can choose your lucky numbers on a grid or use the quick pick option if you want some random numbers. You can enter in the six sweepstakes every day but you can also decide to enter in only one or two sweepstakes. Since entering in a sweepstakes is very easy and all you have to do is select some numbers, you should definitely improve your chances of winning a prize by entering in the six different sweepstakes. FreeLotto.com can offer free sweepstakes and amazing prizes by displaying ads to visitors. You can enter in the six daily drawings without spending a penny! FreeLotto offers six different games you can enter every day. The prizes vary from one game to another. One of the most popular sweepstakes is the $1,000,000 daily jackpot. You can enter for a chance to win this amount on a daily basis by simply selecting some numbers! FreeLotto also offersa $50,000 prize known as the ‘Win A Car’ sweepstakes and a $100,000 prize known as the ‘Pay Your Mortgage‘ sweepstakes. You can of course spend the money on anything you want, but this could be a great way to upgrade to a new vehicle or to finally pay off your mortgage. The other daily games include a $10,000 Fast Cash sweepstakes, a $100,000 Giveaway sweepstakes and a $10 millions Superbucks sweepstakes. You can enter all these different games every day and it’s absolutely free! If you love entering sweepstakes or simply want to get a chance to win a life-changing prize, you should definitely start visiting this website on a daily basis. You can easily enter these six different games every day for a chance to win some cash, pay off your mortgage or get a new vehicle! Before you give the site a try, you should learn more about it. With that said, continue to read on to find out how freelotto.com works. The first thing you need to do is join freelotto.com, which is easy to do, as all you have to do is provide the site with your full name, address and email address. The website collects this info from you for various reasons, such as to verify your eligibility to play the games they have. They also need this info because it’s how they can send you prizes, if you win any prizes. Once you have signed up with the site, you will be able to play the daily sweepstakes, which is done by choosing numbers from a grid of numbers. Just like the real lottery, you can choose your own numbers or you can use a quick pick option, which chooses the numbers for you. There are six sweepstakes games available to play and you can choose which ones you want to play or you can play all six of them. Also, freelotto.com is free to use, but you will be subscribing to receive emails from the site and their sponsors and partners, but you can unsubscribe via your profile page. However, if you decide to not receive advertisements via email, you won’t be able to play sweepstakes on the site. The site does have a subscription service you can use, which allows you to automatically play each game daily for 30 days and you get to choose the six numbers you want to play. The site is easy to use and according to the site, they have paid out millions in prizes. There are also many positive reviews about the site, but you should be prepared to receive quite a few emails after you join the site. Keep in mind that the site is free to use and it is up to you as to whether or not to pay for their subscription service. As you can see, freelotto.com is easy to use and there is no guesswork with how it works. All you have to do is follow the instructions and join the site. If you want the chance to win some money, then consider joining freelotto.com and try your luck. Please. ACTIVATE. IN IT TO WIN. IM A GRANDMOTHER 3 GRANDCHILDREN. IM A GOOD DRIVER NEVER GOT A TICKET OR PULLED OVER . MY AUTO NEEDS REPAIRS. WE WOULD FEEL SAFE LOYALTY2006 VIP ELITE. WE LOVE U THANK YOU FOR A CHANCE TOO WIN. BENTON HARBOR MICHIGAN.